Last week, a new roster came through for NBA Live 16, featuring lineups that have been updated through April 1st. I missed posting the details from the roster update blog over the weekend, so for those who are after details on the latest update, here they are. There are currently thirteen players rated 90+ overall in the game. Meanwhile, the most improved player in the latest roster is Josh Richardson, who now sits at 77 overall thanks in no small part to his hot shooting from the outside since the All-Star break. The April 1st roster also accounts for recent player movement, and contains sixteen gear and accessory changes. For more information, check out this spreadsheet. 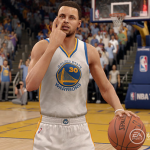 If you have any thoughts on the latest NBA Live 16 roster, feel free to post them in the comments section below, as well as in this thread in the Forum. Marcus Morris of Detroit should be increased. He’s been lights out the last few weeks. I think the notes were pretty vague. Iam glad they fixed Reggie Bullocks 3 point rating the guy was shooting close to 40% but was rated 35 for 3’s and I know Jodie Meeks is out injured but they still continue to rate him as 30 for his 3 point shooting which makes him impossible to use since his talent his shooting the ball. They’re not quite as detailed as they were earlier in the season, I agree. We definitely need Create-a-Player back in the game, as well as other roster customisation tools.